Both Sunset Ridge Trail and El Prieto Trail rest on north-facing slopes, so enjoy large amounts of shade. This means lots of trees, cooler temps, moist soil, and beautiful green everywhere. 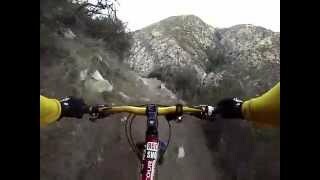 These trails are gems of the San Gabriel Mountains and I highly recommend them, but bring your big-boy attitude to this ride. 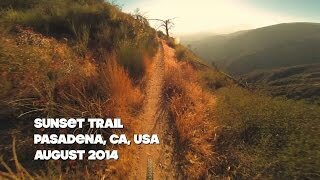 Sunset Ridge Trail is a technical, fairly steep, singletrack. The trail never gets more than two feet wide at any point except some switchbacks. There are one-foot boulder-pile drops in the middle of cliff exposure; sometimes two right on top of each other; sometimes in the turns. There are switchbacks so tight that I had to wiggle around them on my toes... on cliffs. There's a staircase down TO a switchback at some point. In the space between features, there is steep, there is narrow, and I felt most of the time to be on the edge of danger. It's quite a thrilling drop. The El Prieto Trail has many 2'-6' deep creek crossings during the winter. 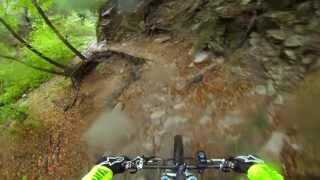 Though lacking the amount of cliff-side real estate of Sunset, this trail has a ton of technical moments. There are rock gardens, drops into crossings, tight switchbacks, cliff-face ribbons of trail, log drops. I think, overall, that El Prieto, though shorter, is the most satisfying of the two. It has more variety, and the terrain is somehow more soothing. Poison oak is common on both of these single tracks. Sunset Ridge Trail and El Prieto Trail are also popular hiking and running trails so please use a bell and be courteous of other trail users. You'll need a $5 National Forest daily adventure pass to display in your window, most local bike shops and big sports stores will have them. Alternatively, if you are up for an even more challenging ride, park for free at Loma Alta Park (parks.lacounty.gov/wps/port…) and climb up the Horse Trail. This is a steep, technical ascent but strong riders will only dismount a few times. The trail intersects with the Chaney Trail road midway, so you can skip the steepest section and climb the paved road to the campground. Park at the top of Chaney Trail (flashing yellow light on Loma Alta Dr.), a steep residential street that turns into a twisting National Forest road (if full, turn left at the top and go downhill to the Millard Campground lot. Ride bike back to top of Chaney). Go around the swinging gate, and right away the paved fire road, Mt Lowe Rd, gets steep and weaves a few times. It levels off for a hundred yards and on the right will be a fenced-in forest service facility. At the end of this facility, look left and take notice of the trail that drops to Millard Campground, you'll be going that way later. For the next two miles, the builders somehow found a way to weave this paved fire road up a mountain without deviating from a 12% incline for a single inch. I mean... STEEP. So put your head down, find a rhythm, and try to ignore the pain. There will be a left-hand split half-way up, but stay right. At exactly 2.3 miles from the gate, look for a trailhead on the left with a sign post. I remember a couple of trees standing near the trail entrance. See the overview above for details on Sunset Ridge Trail. 2.4 miles down from the top, Sunset Ridge Trail eventually merges from the right, like a freeway, onto the pavement of Mt Lowe Rd near the forest service facility. Remember that trail I told you to notice? Now take that right-hand drop to Millard Campground and enjoy, finally, the ability to open it up a little on the flowy section. At the trails end, say hi to the campers as your passing kicks a few leaves into their sites. The path turns into dirt fire road and a one-mile climb starts, up 300 feet, along Millard Canyon Rd. The road peaks then starts to descend. Take the first right-hand turn on a fire road after 1/4th mile of downhill (if you end up at a gate with a house on the left, you missed the turn). This short section leads to the entrance of El Prieto Trail, but from its south side instead of the north like most everyone else does. Look for a small, left-hand drop into the forest below, with an old tire wrapped around the base of the trail sign. El Prieto Trail has a few trail splits to the right. You'll always be safe staying left, but I have taken the third right and it's a fun alternative, merging at the picnic tables a short distance away. For more details, see the overview above. 1.7 miles from the top of El Prieto Trail, it ends at the start of Brown Mountain. Stay right and begin a fairly substantial climb of 1100 feet over 2.6 miles to Brown Saddle Junction, a plateau beneath a tight group of tall pines. Don't take the uphill left, that's another trail. Stay straight through the plateau and begin a one-mile descent on Fern Truck Trail back to the entrance of El Prieto Trail. Backtrack east along Millard Canyon Rd, and for your last challenge of the day, climb the steep paved road from the campground parking lot to your car at the top of Chaney. Hope you enjoy this route as much as I did. I know it's a pain to get a pass to park, but it feels so remote and forest-y up there, like you're miles and miles from the city, even though you're not. It's really a cool place to go for the day, or for a weekend biking/camping trip to explore that whole region. 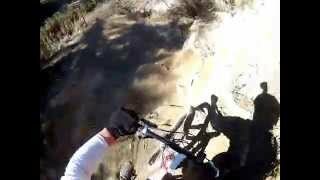 This trail is sketchy and awesome. I wouldn't recommend this for a beginner single speed/hard-tailer like me. I would give this trail 4 stars if it didn't have a 2 mile PAVED road climb. It's called sunset for a reason. The crew drops in at the top of El Prieto. At Fern and Brown Trail junction flat spot. A bit of technical fun on the way down El Prieto. Dawn Patrol solo ride down Sunset Ridge. Prieto Canyon Trail stop for a flat tire. JPL Dam after a nice rain. Start of the Sunset Ridge trail. 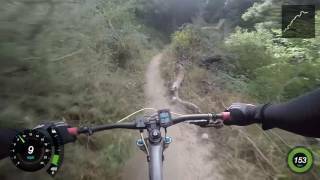 Mountain biking El Prieto Trail in the rain. Watch your noggin, those bushes are dangerous! Half way on Fern Truck Trail.